Fragrance filled the air as travellers and pilgrims made the ascent to the Holy city of Jerusalem. They were filled with excited anticipation. They were drawing closer to the Temple; the Dwelling Place of the King of the universe. In the Holy Place, the High Priest constantly fuelled and lit both the golden Menorah, that represented the Light of His Word, and the Altar of Incense, the fragrance of which indicated His Presence. Gold, myrrh and frankincense, biblically, are associated with kingship. Do our lives emit the mysterious and beautiful fragrance of the soon-coming King of kings? 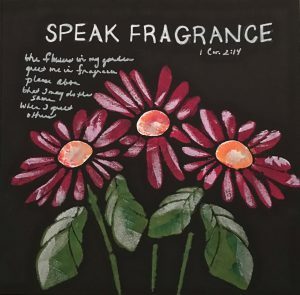 As we learn in the Cheshvan, Being Holy Being Whole notes, we do, importantly, speak fragrance through our words. This entry was posted in Orh Kadosh / Rosh Chodesh Videos by Cindy Lou. Bookmark the permalink.